Movies try to replicate life, however for many of us they are escapes from life. 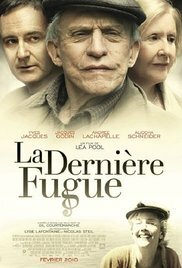 "La Derniere Fugue," a Quebec movie released in 2010 wasn't pre planned for me, but just a time filler to keep up my pace of watching movies. Getting into it woke me up. This really was not only life and death, but somewhat about the meaning of life. It begins with a Christmas family around the dinner table with parents sitting down and kids running around. The head of the family, the grandfather has Parkinson's, with trouble speaking and feels shunted aside. He is not supposed to eat dessert or a lot of special Christmas items. He loses his temper, falls down and causes a lot of embarrassment. He mocks one of his daughters who is going through menopause causing her to leave the table. Another couple are bickering. A teenage grandson talks with his father and says he would like to help grandpa to die. At first it seems poorly thought out and disrespectful. Over the course of the movie he conspires with his father who carries resentment and guilt from childhood. A series of flashbacks with a different set of actors helps to put things in context. One episode is remembered bitterly by the son whose father pushed him aside into the water when he was about to catch a large fish. The father took credit for it. Later we learned the father (the grandfather) confessed to his wife and expressed regret, but never brought it up to his son. Many of us parents have done things we regret to our children and now rationalize that we are more mature now. In many of the flashbacks we see the younger grandfather playing the piano and spouting off a wide range of scientific facts to his children. Back to the current time the one son tells that his father was too smart for what he had to do to make a living and had to keep quiet. The grownup children talk to their mother with the idea they should put their father in a home. They appreciate their mother is exhausted. The one son and his son talk to the grandmother and tell her they want to make it easier for the grandfather to die. They have in mind letting him eat what he really enjoys. Early in the movie they give him some forbidden potato chips and emergency ambulance is called in only to realize he was only choking. She defends her husband and says, (paraphrasing) he doesn't really want to die because even though they are good Catholics they fear that after death there is nothing. After a humiliating physiotherapy session the Grandfather says he wants to die. His wife and son and grandson set out to make his last days as enjoyable as possible. He explains about favoured foods and above all wants to go fishing back at the lake he remembers. At what would be one of his last meals the family is recalled and on this occasion one of his son-in-laws explodes and says he is leaving his wife. Then they are all told the grandfather knows he is going to die soon and welcomes it. You might guess the gist of how it ends, but you will miss a lot of details. Another line got my attention. Youngsters are always trying to figure how their elders ever got together and what it was like. The grandson asks if they ever French-kissed. The Grandmother laughs and says "of course. What a silly question?" Animals appear in a lot of movies and are specially trained for their role. Fish played a critical role in this move and I marvel at the effort that must have occurred to help move the plot. Lea Pool directed and co-wrote the script. She was born in Switzerland and many of her films seem to have Swiss backing or characterization. Many of her films have won international awards, such as "Emporte-Moi," "Le demoiselle savage," "La Passion d'Agustine" and "Lost and Delerious," none of which I have yet seen. One I saw was in English, "The Blue Butterfly" which also won awards. I have already reserved a few of her films. Gil Courtemanche, co-wrote from his novel, had been a journalist and television host. He investigated the Rwanda genocide and wrote ""Un dimanche a la piscine a Kigali" which won the French version of Canada Reads and was also turned into a movie. Died in 2011 after this movie. The title refers to some piano music that the protagonist was playing. I recognized two tunes form Bach that I enjoy. The Grandfather was played by Jacques Godin and he made you feel uncomfortable and embarrassed for his family. I had seen him in a forgotten move released in 1964, "The Luck of Ginger Coffey." The grownup son was played by Yves Jacques who I had been seen in one French movie with Audrey Tautou, "Therese" and two Quebec movies, "The Barbarian Invasion" and "Jesus of Montreal" (1989) Some of you might have seen him in "The Aviator" or "Grace of Monaco," but I missed both of them. The Grandmother was played by Andree Lachapelle who was also in "Jesus of Montreal." Also appeared in "Leolo" and "La Passion d'Augustine." The grandson who conspired to give his grandfather an enjoyable death was played by Aliocha Schneider in only his second movie. After this he has become busy with tv series and a few more movies. Aliocha had a deft touch displaying a deep concern for his grandfather, but also able to have fun. Not everyone will enjoy this movie, but there are light moments as well as life and death decisions. That book title sounds innocent, perhaps even helpful. At my age I thought it might give a few hints on how to get more out of life. Well it does, sort of, but it is really philosophical and pointed at dealing with the human avoidance of our inevitable death. Michael Kinsley will make you laugh a bit while you ponder the bigger questions of life. Just to be clear most readers would consider his humour on the black side, but like good humour it hits a point. Michael, himself learned at a relatively young age (23 years prior to this book) he had Parkinson's which he thinks of as an early signal for his own mortality forcing him to think ahead. He was fairly successful as a journalist and editor for such media platforms as The New Yorker, Vanity Fair, Slate, Harper's and The Economist. We all tend to not think of our inevitable death, but as we age it becomes harder to ignore and some of us are hit with a fatal disease that sharpens your focus. When we wake up to the end, we have three choices: denial, acceptance and confrontation. Michael feels acceptance is no strategy. He mostly opts for denial with the concept that his disease will have minimal impact on his life. He admires those who choose to confront. He chooses to take a humorous perspective. One bumper sticker, "he who dies with the most toys wins" is contrasted with "you can't take it with you." In the end possessions are cast aside as not being the ultimate goal. Having increasingly noticed that longevity is often accompanied with dementia, many people would amend their future hopes. Cognition becomes identified as what we want to hold onto as long as possible and when it is diminished so is our life value. Outside the book, I am reminded of a Pacific Island where they view Alzherimer-like diseases differently. The victims are often happy and in all cases relatively oblivious of reality. Maybe they are better off and although we fear becoming that way, the real problem is the extra concern and labour of the care givers. No one wants to be a burden, but maybe it is an easier exit if one is unaware of it. As I am a very small fund raiser for Parkinson's I was interested in some given information. Side effects are often overlooked, but include for some patients, depression, bad skin, insomnia and a gambling compulsion. I had heard of deep brain stimulation that gives relief to some, but didn't realize it was performed while the patient is conscious. The author advocates stem cell research. He is well aware that his body and mental faculties are declining. Told by one doctor that he would lose his "edge," Michael was very conscious that his success had hinged on his "edge." Another concern is for our reputation. Although his Parkinson's disease has been proceeding slowly Michael has noticed that people assume he is not quite as bright as he once was or as capable and tests confirm this notion. Reputation, or better still fame seems a worthy goal. He runs through a lists of dominant people in different fields and concludes that most are not remembered. Jane Austen was not famous at her death, but about 75 years afterwards with the help of relatives her fame began to rise. Earlier in the book he relates an account with Robert McNamara in his 80's admittedly making amends for his role in the Vietnam disaster, something the author points not everyone gets to do. Another goal associated with impending death is to leave a legacy As a boomer he has a lot of criticism for his own group, deferring to what he thinks was a more deserving group--the ones who fought WW II. There is a lot about how greedy each generation can be, but hard to deny the previous generation did something noble. He ends on a political note, about how he thinks we boomers should leave a legacy. He thinks we have spent our government into unimaginable debt and that the estate taxes should be revived to reach more people, not just the filthy rich. Fortunately for us who are only vaguely aware of what happens at the end of old age, Michael has retained some of his edge and we are the better for it.